Batman is turning 80 on March 30, and it’s time we celebrate the man, the bat, the legend. Welcome to day two of this series as we tackle Batman in the 1940s. We will break it down by comics, TV, films, and general culture. Because of the breadth of his impact on the world, there is no way we can hit every landmark moment, but we’re going to try our best to bring you an overall history of the infamous Batman. As 1940 dawned, Batman had no issues with maiming or killing bad guys in the comics, but all of that was about to change. It was decided that Batman needed a softer side, and, additionally, Bill Finger thought he needed a ‘Watson’ type character he could discuss cases with. With all of this in mind, in Detective Comics #38 the world was introduced to Robin. There was, however, to be a second change to the character, and one that still causes more debates than anything else when it comes to discussions of Batman. Not only did the first issue of Batman introduce us to Joker and Catwoman, but it saw Batman kill some giants. Whitney Ellsworth, the editor at the time, decided to put an end to that sort of story for Batman, and it was then put into action that Batman could no longer kill or use a gun. 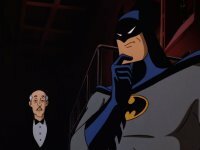 Within the first three years of Batman’s existence, almost all of the elements were established that make up the general mythos of Batman. While 1939 gave us the Batplane, Batarangs, and his origin story, we oddly did not get an iconic Batmobile up until 1941. In Batman #5 we finally saw a bat-themed car. Up until that point, Batman and Robin had gotten around in a car that happened to be bright red and was even referred to as the ‘Batmobile’ as of Detective Comics #48 in 1941. It’s easy to see why the decision was made later to go with something a bit darker. Also of note in the 1940s was Gotham City getting a name (Detective Comics #48) and the first appearance of the Batcave (Batman #12). Vicki Vale became the first lasting love interest for Batman after making her debut in 1948 in Batman #49. As you can see, it was a full decade for Batman and Robin as villains that are synonomous with the duo seem to have been turning up every few months. Comic books, in general, started to turn to more outrageous stories throughout the 1940s thanks to the real-world atrocities occurring around the globe during World War II. Batman and Robin’s crimefighting became a bit more over the top, even resulting in the first time they ever time traveled in Batman #24 in 1944. The destination was ancient Rome. To be fair, matinee serials were not technically movies. They were, however, shown at movie theaters, so hence the heading. The first of two serials, Batman, debuted on July 16, 1943, and ran for 15 chapters. This serial was notable as it was the first time Batman appeared on screen, but it also had some lasting impacts on the comic iteration of the overall Batman legend. The serial ended up leading to a permanent change in Alfred’s appearance. Up until this point he had been depicted as heavier set and somewhat bumbling. Following the serial, he was changed to look more like the actor William Austin who has portrayed him on screen. Following the 1943 serial, the character took a break, but returned in 1949 for another 15-part story, Batman and Robin. It debuted on May 26, 1949, and, unlike its predecessor, left no lasting marks on the character or his mythos. In our next installment of the series, the fallout from Seduction of the Innocent as we enter the 1950s. Josh McDonald and Jay Yaws contributed research to this post. Be sure to enter our Batman 80th Anniversary giveaway!